This is one of my most popular go to cookie recipes. 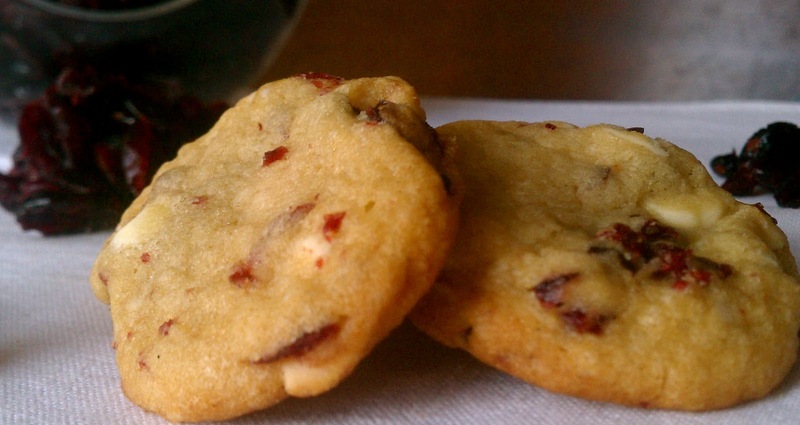 I absolutely love white chocolate, and the dried cranberries balance the cookie perfectly. I add amaretto to the dough which you can omit if you choose, but I do firmly believe that booze and baking go hand in hand! It adds another layer of flavor to the cookie. When you first bite into the cookie you get the sweet effect. Next the sweetness gets cut by the perfect bite of cranberry, and last but certainly not least you get this slight hint of almond. The most important part of this recipe is to use quality white chocolate. Please do not use those white chocolate chips from the supermarket. That is pure torture for a pastry chef…. please use a brand such as Callebaut. It will cost you a little extra, but it really makes a difference. Thank you! Mix in cranberries and chocolate. Wrap dough in plastic wrap and refrigerate over night. Scoop cookies with a cookie scoop so they are all the same size, I use a 1/2 ounce scoop. Bake cookies at 350 degrees for 10-11 minutes rotating once half way through. >I make a similar cookie with the addition of oats. It's one of our favorite cookies too. I'll have to try chilling the dough.